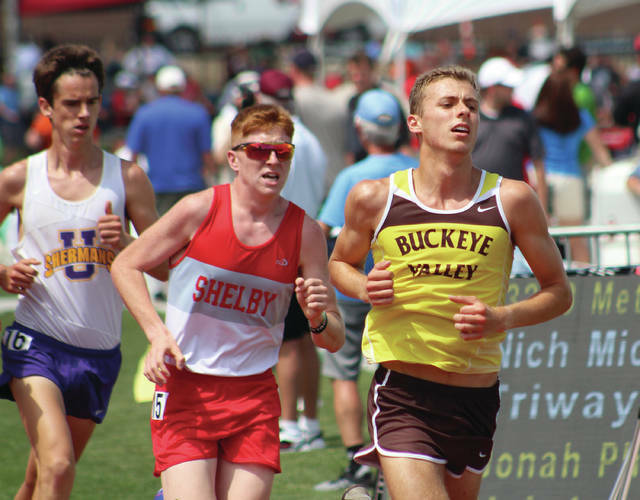 Buckeye Valley’s Zach Kreft, right, competes in the Division II boys 3,200-meter run during Saturday’s OHSAA Track and Field State Championships at Jesse Owens Memorial Stadium. Buckeye Valley senior Zach Kreft knows what the top of the podium feels like. He was just there after winning the Division II cross country championship in the fall. He was there the year before, too, when he captured the first of his two cross-country crowns. He found himself climbing to the top Saturday as well, this time after winning the Division II boys 1,600-meter run during the OHSAA Track and Field State Championships at OSU’s Jesse Owens Memorial Stadium. Kreft took top honors with a time of 4:16.18. Kreft nearly earned a second title an hour or so later, finishing second in the 3,200 with an effort of 9:22.38. Versailles senior Joe Spitzer, who elected not to compete in the 1,600 so he’d be fresh heading into the two-mile event, won in 9:14.97. Kreft said keeping up with the fresher Spitzer was a challenge … but one he most certainly wasn’t going to back down from. “I was tired after the 1,600, but I knew I worked hard to get here … that’s what pushed me through. Yes, I did lose to someone who took the 1,600 off to race the 3,200 fresh — he ran a great race — but I know the outcome would have been different if I decided to run the 3,200 fresh as well. Kreft wasn’t alone on the top of the podium, either. Two other Delaware County standouts earned state titles of their own. Olentangy senior Siobhan Szerencsits won the Division I girls pole vault with a mark of 13-03.00 and Olentangy Orange senior Jayden Rodgers took top honors in the D-I boys 110-meter hurdles. After passing on the first three heights, Szerencsits cruised to the 13-foot mark without missing a single attempt. She was the only vaulter to get there unscathed and, by the time 13-0 rolled along, her and Geneva senior Deidra Marrison were the only two competitors left. Both missed their first two tires at 13-0. Marrison missed her third as well. Szerencsits, though, cleared the height on her final try to take the title. She then cleared 13-03 on her third attempt before missing three straight at what would have been a state-record height of 13-06.50. Delaware Hayes senior Madeline Hayes also competed in the event, finishing tied for 10th with a height of 11-0. Rodgers, meanwhile, won the 110 hurdles in 13.89 seconds. He won his heat during Friday’s preliminaries and entered Saturday’s final with the second-fastest prelim time (14.05 seconds). The only runner to post a faster prelim time, Brush senior Quentin Woodall (14.02 seconds), was the guy he edged at the finish line in the final. Woodall nabbed runner-up honors in 13.94 seconds. Other results from Saturday’s final day included those from Big Walnut’s Tim Rumas, who closed third in the Division I boys 100-meter dash (10.76 seconds) and fourth in the 200-meter dash (21.47 seconds); Orange’s Andrew Schroff, who was ninth in the D-I boys 1,600 (4:16.35); Hayes’ Torie Young, who finished eighth in the Division I girls 400 (57.46 seconds); Orange’s Grace Frye, who was fifth in the D-I girls 300 hurdles (44.19 seconds) and ninth in the discus (124-11); Orange’s Tyler King, who finished 14th in the Division I boys 800 (1:56.72); Big Walnut’s Kaley Rammelsberg, who finished 11th in the D-I girls high jump (5-04); Olentangy’s Holly Nation, who was 13th in the Division I girls high jump (5-02); Orange’s Jaeschal Acheampong, who was ninth in the D-I boys long jump (22-10.50); Olentangy Liberty’s Luke Bendick, who was seventh in the Division I boys pole vault (14-06); Big Walnut’s Brandon Mosher, who finished third in the D-I boys shot put (58-05.50) and 13th in the discus (155-06); Liberty’s Gracie Sprankle and Emma Bower, who finished fifth and ninth in the Division I girls 3,200 with respective times of 10:39.07 and 10:52.28; Liberty’s girls 800-meter relay team of Carrie Lawal, Nicole Tonetti, Brea White and Sydney Englehart, which finished fifth (1:41.96); Orange’s boys 800-meter relay team of Joel Sarpong, Kevin Acheampong, Max Stewart and Jaeschal Acheampong, which finished fourth (1:28.22); the Pioneers’ girls 400-meter relay team of Brenda Agyekum, Frye, Maya Patterson and Mackenzie Blendick, which finished third (47.76 seconds); and Orange’s boys 1,600-meter relay team of Jaeschal Acheampong, Christian Wright, Manny Anderson and King, which closed third (3:19.76). In D-II, Buckeye Valley freshman Chloe Dawson finished sixth in the Division II girls 1,600 (5:07.38), BV senior Bill Daily closed 13th in the D-II boys 1,600 (4:31.58), Baron senior Joey Verdes was 15th in the Division II boys high jump and BV freshman Chloe Gibson finished eighth in the Division II girls long jump (17-00.75).